cannot see out of his eyes! 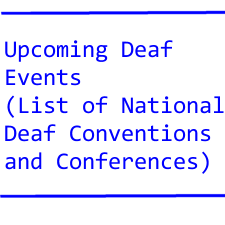 is not too eager to make their ads deaf-friendly. struggles with captions and interpreters. the right thing for a young deaf model. sign language users. Exactly how it works? Not sure how, but this I/T man says it works! prisoners! Why deaf guards and not hearing guards?